We were rather surprised at the reaction from passengers when we said we were going to retire. Some got on the phone immediately, saying “You can’t!” Boaty people contacted us to say “Hang on for a bit while we think about whether or not we could make this work for us”. So here we are, arms twisted (no, it didn’t take much!) to continue this season to give people time to work out whether or not a business like this is for them. It’s easy to get passionate about Ocean Dynamics jet boats but this is a lifestyle business you can earn a realistic living from. It’s been a great way of life for us but it’s not for everyone. Clearly running a boat business in rural Pembrokeshire is a dream for many: clean fresh air, beautiful scenery and a short commute! Running a jet boat business has given us an enviable degree of freedom. We can take the boat out to enjoy Ramsey at its most spectacular and have the seas to ourselves. We don’t have a boss so can run things as we see fit. We also take full responsibility for everything from the ground – usually covered with to-do lists or stinking weed on a slipway 🙂 – up. For those who’ve worked boats for other people, often offshore and a long way from home, the idea of a short commute and coming home every day after working around Ramsey is deeply attractive. It’s clearly also pulling at the heart strings of people with a passion for RIBs who want to downsize, get out of the rat race and do something they can get passionate about. When Tim started working RIBs in the late 70s with Shaun White, who designed the Ribworkers, there weren’t any other RIB tours in the UK, now they’re everywhere. When we set up Venture Jet we knew it was important to offer a genuinely different adventure experience. 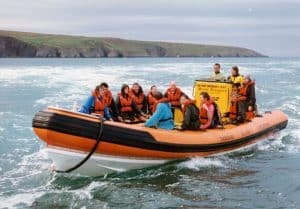 We invented the ‘Wet and Wild’ trips to make the most of Shearwater’s unique manoeuvrability – this isn’t ‘just another RIB ride’. This is our 15th season as Venture Jet (we both worked jet boats around Ramsey for many years before that when working with Shaun – see photo left). Over the decades we’ve proved that you can give people a memorable and exciting trip while keeping them safe. While Venture Jet is a lifestyle business it has the work and challenges of any business. If we hand the business over then the new owners will be able to hit the ground running because it’s already set up and ready to work for them. The business has been designed to be very flexible and whilst we have generally worked from St Davids work needn’t be confined to St Davids. We chose not to have a public office in St Davids, the only boat business to have been able to operate successfully without an office. While the business works very well in St Davids and we are blessed with an amazing coastline with an unusual variety of wildlife and caves, the business could move elsewhere in Pembrokeshire or further afield. Shearwater’s unique ‘Wet and Wild’ manoeuvres and workboat capabilities could be adapted to any market. 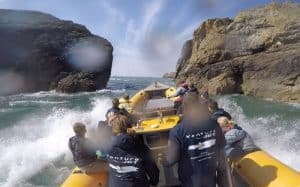 We’ve lived our jet boat adventure – we’re still living it 🙂 – but now is the time to pass it on to younger hands or to rehome Shearwater elsewhere. We’re happy to hand over the business as early or late in the 2018 season as would suit new owners, or indeed to run this season ourselves and hand over next winter so that the new owners can hit the ground running for the 2019 season. We do not have to sell the business so if we don’t find someone for whom the business would work we’ll be looking at rehoming Shearwater separately from next autumn. While we’re prepared to give as much support as a new owner might need for the coming year or so, we want to move on with other projects.